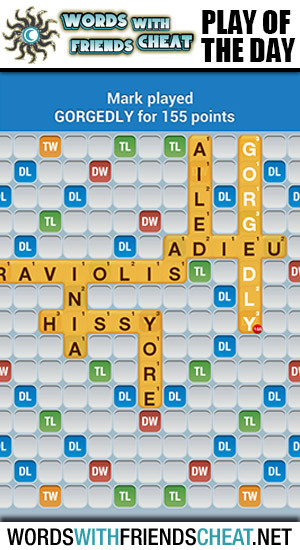 Today’s Words With Friends – Play Of The Day is GORGEDLY (155pts) and was submitted by Words With Friends Cheat user Mark. Mark unleashed a violent attack on his opponent by throwing down everything he had in his arsenal. In conjunction with the full rack bonus, Mark used a triple word, double word, and triple letter to earn a score of 155 points. 1. a narrow cleft with steep, rocky walls, especially one through which a stream runs. 4. something that is swallowed; contents of the stomach. 5. an obstructing mass: an ice gorge. 6. the seam formed at the point where the lapel meets the collar of a jacket or coat. 7. Fortification. the rear entrance or part of a bastion or similar outwork. 8. Also called gorge hook. a primitive type of fishhook consisting of a piece of stone or bone with sharpened ends and a hole or groove in the center for fastening a line.